Over the last few days, I've tried to be transparent, honest, and clear about my thoughts on the accusation against Supreme Court nominee Brett Kavanaugh. I've consistently averred that I have no idea what, if anything, happened between Professor Ford and Judge Kavanaugh in 1982, when they were both high schoolers. Nor does anyone else, with the possible exception of three human beings, according to Ford's allegation (two of whom contradict her story). Another supposed witness has also come forward and failed to back up the accuser's account, which we'll address later today. I've allowed that Prof. Ford might be telling the truth, and Kavanaugh might be lying. After all, there are substantial downsides to lobbing a bombshell claim at a prominent figure, including inviting misinformation or smears. I've suggested that perhaps something like this did happen to her, but her memory has filtered in (or out) certain elements of the recollection -- which is a scientifically-confirmed phenomenon that can occur, especially over time. In other words, she could be genuinely convinced of a the veracity of a partial or false memory. Or she could be a committed partisan who's outright lying and is part of a carefully-timed, calculated scheme to bring down Kavanaugh. We just don't know. Because we don't know, we must do our best to determine the credibility of the claim, and claims in relatively similar circumstances, based on some sort of roughly consistent standard. Like Mary Katharine Ham, David French and others, my "rules" for this kind of thing -- when hard evidence is unavailable -- boils down to: (1) Do we have an on-the-record accuser with a specific allegation? (2) Is there any compelling contemporaneous corroboration of the accusation from the time of the alleged conduct? (3) Does the allegation fall in line with others that are similar, developing a potential pattern of behavior? Even if the answer to all three of these questions is 'yes,' that combination still may not come close to satisfying the legal threshold of "beyond a reasonable doubt" proof. But political and cultural standards aren't the same as those that apply in a court of law. As an illustration, in light of the fact that the claims against Roy Moore checked all three boxes, I was inclined to believe his accusers, and I said as much publicly. The same applies to Bill Clinton, against whom there was significantly more evidence in support of much more serious charges. (Reminder: Several of the Democrats now trying to crucify Brett Kavanaugh with far less substance did not lift a finger against Clinton -- and, in fact, actively shielded him and ignored or disbelieved her, likely for partisan reasons). In the case of Prof. Ford and Judge Kavanaugh, we are looking at exactly one of those three components -- and we didn't even have that until after Kavanaugh's confirmation hearings ended, in spite of the Democrats possessing Ford's account months earlier. Item two is missing, as is item three. That could conceivably change, I suppose, but this is where we currently are (update: Ford herself has stated on the record that she told nobody about the incident for 30 years, casting major doubt on anyone who says otherwise). It must also be noted that there are some discrepancies and gaps in Ford's own story; these deserve close scrutiny because the details she'd provided are the only purported evidence we have to consider about the alleged incident. She cannot specify the date or location of what she says was an attempted assault. She cannot recall how she ended up in a room with two boys. The therapy notes from 2012 -- when she says she first shared her story, 30 years after the fact -- say that four males were involved in the attack, not two. Ford says this was a misunderstanding by the therapist (whose notes did not name Kavanaugh). Ford's attorney also appears to have changed the number of people at the party where the encounter allegedly took place, adding a girl who did not appear in Ford's account to the Washington Post. So let's correct some historical injustices by defaulting in the other direction, thus guaranteeing more injustices -- while ignoring documented cases of false accusations and proudly spitting in the face of the presumption of innocence. Under this rubric, the Duke lacrosse fake "victim," mattress girl, and "Jackie" were all telling Larger Truths. Tough luck for the young men whose lives they attempted to destroy. And tough luck to Brett Kavanaugh, regardless of the ascertainable facts of this case. This ABC commentator should hope to heaven that nobody ever decides it's in their interests to visit some 'tough luck' upon him with accusations that we must believe, because 250 years, etc. When I asked Kaine if there was anything a truly innocent person could do to prove his innocence here, Kaine replied: "That's kind of very hypothetical." When Democratic senator and Judiciary Committee member Richard Blumenthal of Connecticut was asked how he would evaluate the accusation, he seemed to have already made his mind up. "I believe the survivor,” Blumenthal said. “This woman has demonstrated that she's willing to endure a nightmare of intense and hostile scrutiny.” But Blumenthal couldn’t say how an innocent person could clear his name in these circumstances...I'm not speculating on what the standard should be. It's actually not "very hypothetical," Sen. Kaine. It's quite real, and quite immediate. And even if we're interested in the truth-related judgment of someone who consistently lied about his own military service, perhaps Sen. Blumenthal should give some thought to, you know, standards of proof regarding the case of this man before his committee. 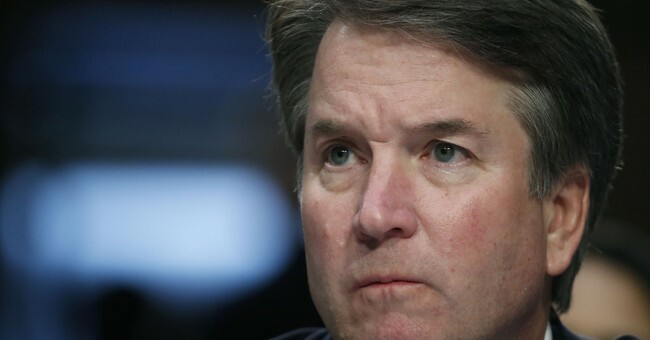 Parting thought: Some lefties are preemptively dismissing Kavanaugh's sworn testimony in his own defense by claiming that he's already lied under oath in his confirmation hearing. This is a baseless attack (we've seen a few of those from Democrats, haven't we? ), for reasons exhaustively detailed here. UPDATE - Joe Biden sounds like he's jumping aboard the presumption of guilt express.